PM Netanyahu, Minister Erdan visit Yamam Swat unit, praise them for capturing terrorists behind recent attacks. Prime Minister and Minister of Defense Binyamin Netanyahu and Internal Security Minister Gilad Erdan visited the Yamam (SWAT) base Thursday to praise the officers for their recent actions in defending the State of Israel. The visit was also attended by Shin Bet Director Nadav Argaman, Deputy Commissioner General Moti Cohen, Border Police Commander Yaakov Shabtai, the Yamam Commander and other senior officials. 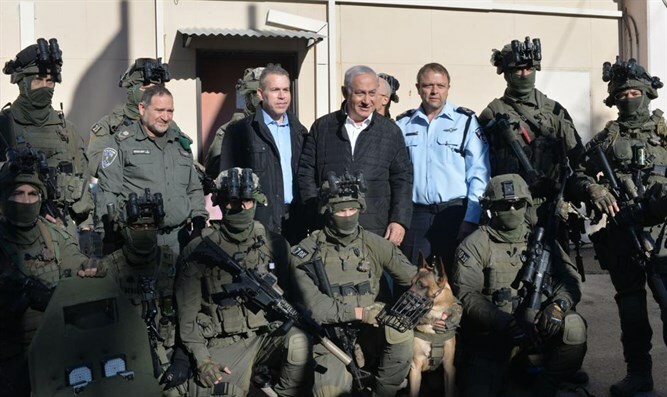 Netanyahu met with the unit's soldiers and praised them for their activities in capturing the terrorists who carried out the attacks in Ofra, Barkan and Givat Asaf. The Prime Minister held a discussion at the site where he heard reviews of the combined operational-intelligence activity of the security bodies. During the visit, Netanyahu said, "I was very impressed by the visit to the Yamam. This combination of SWAT and Shin Bet officers, who provide excellent intelligence, gives us the best anti-terror unit in the world. All the countries come here and ask me: 'Bring them to us, we will learn from them,""
"What the citizens of Israel need to know is that anyone who harmed or murdered an Israeli citizen in the past year or was killed or captured. This is an unparalleled achievement in the world and it is because of these men, because of their daring, heroism, creativity and commitment. All the people of Israel know that Israel's hand will reach [the terrorists], and it reaches them through the SWAT fighters and through the Shin Bet," he said. Minister Erdan said during the visit, "The command that directs the Israel Police's anti-riot police is to 'chase my enemy and catch them and I will not return until they are dealt with.' The recent achievements of the SWAT unit prove once again that it is fulfilling this command every time. It is not coincidental that the most common request among ministers of internal security from around the world to me is to send a SWAT team to train police forces around the world to deal with various terrorist scenarios. I will continue to do everything in order to enhance the SWAT's ability to save lives and close accounts with terrorists."